It is possible that the ultimate example of the Taoist concept of yin and yang may be contemporary science and religion. 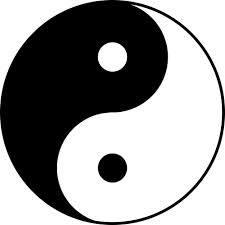 Yin and yang are actually complementary, not opposing, forces, interacting to form a whole greater than either separate part; in effect, a dynamic system. Everything has both yin and yang aspects, (for instance shadow cannot exist without light). The sigmoid wall that separates science and religion is necessarily impenetrable. Science depends on facts (as we perceive them) that can be predicted and reproduced. Religion depends on faith that can not be predicted or reproduced. There are times, however, when transitory chinks appear that allow peeks through the wall. Backpackers camping on a high mountain peak on a crisp, clear, night are often treated to a cosmic display that evokes wonder, awe, and perhaps contemplation. Somehow the out-dated “steady-state” theory (“the universe was always there”) seems soul-less, empty, insipid. So, if the “red-shift theory” is correct, and there was a universal creative event, who (or what) made the trans-galactic view? Even though it is not “scientifically correct” to ascribe the creative event to a Supreme Being, can scientists not theorize that the event was caused by a being, power or process that is beyond human comprehension? The sigmoid wall, of the yin and yang of creation and evolution, is much more permeable. Assuming the mountain-top view was created, we also know that it has evolved, and will continue to do so. In fact, what we are seeing does not really exist. The light from stars long gone is still reaching us. The light from newly created stars may not reach Earth for several million years. It is now clear that the continents on Earth are “drifting,” mountains are being formed and eroded, deserts have come and gone. The Earth was mysteriously created and now is evolving. The evolutionary history of life, although not complete, suggests that life began at the prokaryote level and has progressed to Blue Whale, Sequoia, nuclear physicist and opera diva. However, just as new stars are being formed, new life forms (even species) are being created. Gregor Mendel and Luther Burbank formed the sciences of theoretical and applied genetics and modern scientists can now “create” modified life forms that previously did not exist. Perhaps we are finally at the level of intellectual maturity where we can stop bickering and celebrate the synthesis of “Creavolution.” After all, creation and evolution simply can not exist without each other. Every creative event evolves and all evolution begins with a creative event.